“Making your money work for you” is as far as most investors think. But you will only get ahead by ethically making “other people’s money” work for you. You learn how. "Making your money work for you" is as far as most investors think. But the wealthy get ahead by ethically making OTHER people's money work for them - and in a way that actually serves society. You can too and you learn how returns of less than 25% are disappointing. Most people know that real estate investing has ... See More created more millionaires and billionaires than anything else. You learn how to do it without being a landlord or learning a special skill. 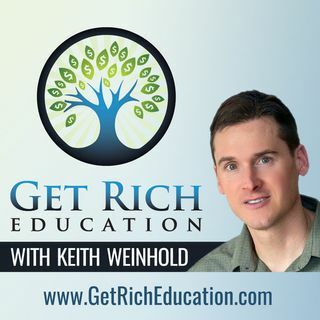 Get Rich Education is a free podcast that shows you how to create permanent wealth for yourself in a clear, fun way. Robert Kiyosaki and his Rich Dad Advisors are frequent guests on the show. Show Host Keith Weinhold is a Contributing Writer to the Rich Dad Advisors.